As longtime readers know, puzzle games centering around logic and deduction can come in many different forms, from cats milling around a living room to abstract shapes interacting in curious ways. They often have many moving parts and solving mechanics to keep in mind. But other logic puzzles strip away flashy trappings and overly elaborate designs and take a minimalistic approach to puzzling. The subject of today’s product review, Chroma Cube, falls neatly into the latter category. 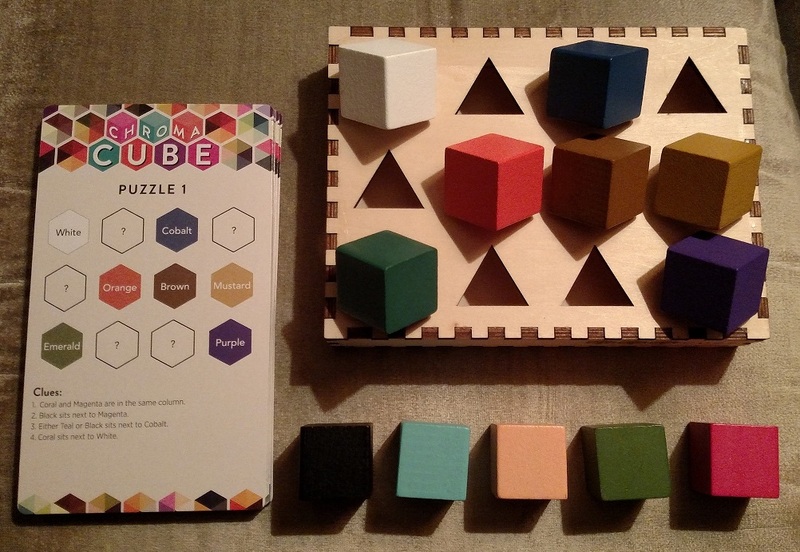 Chroma Cube boils a deduction puzzle down to its essentials, employing pleasing design that seems basic, but allows for great depth and challenge nonetheless. All you need to tackle Chroma Cube is a game board, twelve colored cubes, and your challenge cards. The object of the puzzle is simple: complete each challenge card by placing all 12 cubes in the correct positions on the board. Most of the challenge cards place some of the colored cubes for you to get your started. Once you’ve set up your board to match the starting pattern on the card, it’s up to you to use the clues provided to figure out how to place the remaining cubes. The challenge cards ease the solver into the puzzle at first, relying mostly on clues about positioning on the board, referring to rows, columns, and neighboring cubes. As you might expect, with each new challenge card, the puzzles increase in difficulty, and the clues grow more complex and inventive. Some refer to colors only by the first letters — leaving you to ponder whether it applies to Brown or Black, for instance) — while others offer contextual clues, like a rule that the cubes in each row should be in alphabetical order from the left to right. A few even rely on knowledge outside the puzzle game itself, like knowing the colors in the Irish flag. These clues are rarer, but add a nice bit of crossword-style flavor to an otherwise Sudoku-like solving experience. The team at Project Genius did an excellent job of keeping the clues fresh and interesting, constantly introducing new rules and wrinkles to the puzzles. By the time you’re encountering puzzles with no set cubes, or ones that require you to swap set cubes with newly placed cubes — a very clever twist on the idea of “set” pieces — you realize that no matter how many tricks you’ve figured out, the challenge cards have new ones waiting for you. Chroma Cube’s later challenge cards offer plenty of difficulty and cluing craftiness to keep established puzzlers coming back for more, but without alienating new solvers that have developed and honed their deductive talents by playing through the game’s earlier scenarios. I was thoroughly impressed by how much the creative team at Project Genius got out of 12 colored cubes and a wooden board to place them on. Not only that, but the game is beautiful, eye-catching in its presentation. The wooden pieces have a weight to them, and solving is a delightfully tactile experience. (The challenge cards can be tucked away in a slot within the board, making it a breeze to move around the house. Heck, you could easily leave it on your coffee table as a puzzly conversation piece and it wouldn’t look out of place. Chroma Cube is a wonderfully visual take on classic deduction-style solving, one that will keep you on your toes from the first challenge card to the last. 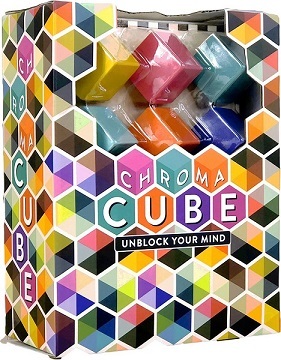 Chroma Cube, distributed by Project Genius, is available at Barnes & Noble and other participating retailers.